This Bad Boy was in this cottonwood on my way home this evening. 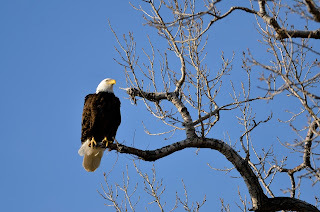 It always amazes me that there are Bald Eagles in NE. Growing up these majestic birds were endangered. I am thankful that steps were taken to make sure that these birds had a chance at life. Now sightings are not all that rare. But they still are special.